Goodbye to the former Airtel 1hour for N100 and 2hours unlimited download with N200. 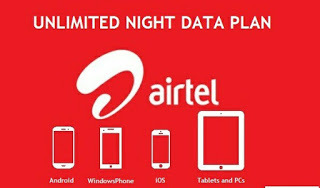 Lets welcome the latest and Cheapest Airtel 1.5GB, 500mb and 1G Night Plan. Below are the settings for data bundle plans. Airtel also introduced 1GB for N500 which is valid for 1week AND N200 for 200MB + 30Min Airtel calls weekend offer and free 15mb for 7days when you recharge with N200. The call tariff on SmartTrybe offers 11k/s calls charges for all national networks (N6.60K/min). Step 1. Firstly, you have to migrate to Airtel SmartTrybe by dialing *312# then reply with 1. Will you rock this? It is best used when there is NEPA in your area. Just stay a day full with sleeping and drink a sachet of coffee, to stay awake for one night.